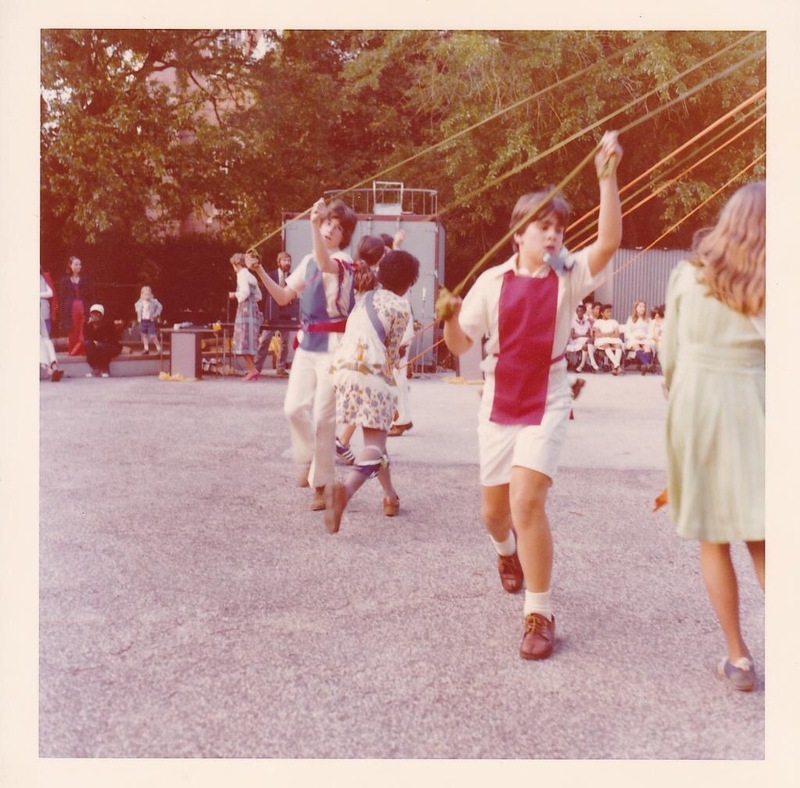 Photo from St. Peter’s May Day celebration early 1970s. When I was a little girl I went to St.Peter’s School at 4th and Pine in the Society Hill section of Philadelphia. We celebrated May Day as a school. May Day was something all of the kids looked forward to. Somewhere I have photos my mother took, but the first photo you see in this post and the last were given to me a few years ago by my childhood and adult friend Anthony. What you see in the photo was some of the dancing we did along with the dancing around the Maypole which weaved beautiful and bright ribbons into a lovely pattern as we went round and round. May Day was such fun! There was the dancing around the Maypole and the other dancing which included dancing over clay pipes – a very Celtic/Gaelic dance. 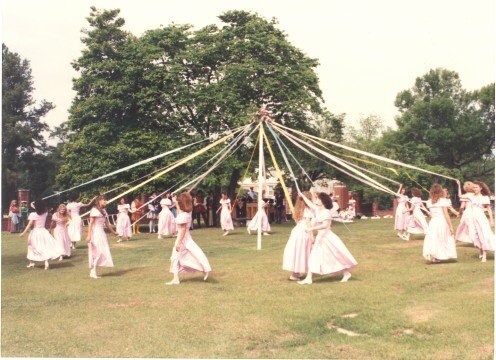 I was never coordinated enough to do any of the fancy or specialized dancing but I loved the magic of the Maypole and all of May Day. In my minds eye I still have a little flickers of memory of these May Day events. I swear today I can hear echoes of the music and clapping! I remember as a little girl it was the one time I wanted to have the right dress for May Day celebrations. Two photos are from when I went to St. Peter’s but the other photos are old photos I have found on the Internet so people can see what the celebrations were like. Caroline Seamans, the Headmistress of St. Peter’s when I was a girl instilled some wonderful traditions. 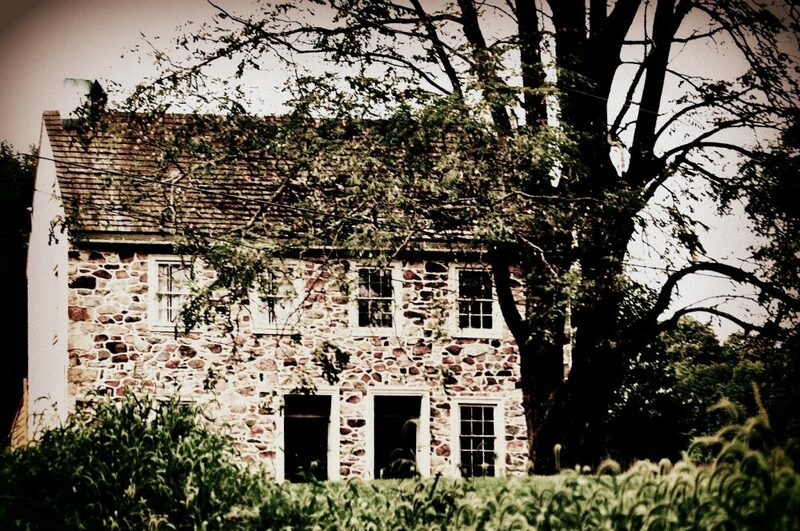 It was a great place to be a child. It wasn’t perfect, and like any school had issues, but was a pretty cool place. May Day is known also as International Workers Day and today the news in our area is showing demonstrations of public school teachers in front of City Hall in Philadelphia. But that’s not the history of May Day I remember as a child. May Day is a traditional spring holiday in many cultures, to this very day. Early May Day celebrations started with ancient Romans who celebrated the Festival of the Roman Goddess of flowers, Flora. Ancient Romans held on April 27. Germanic countires celebrated Walpurgis Night celebrations of the Germanic countries and in the British Ilses was the Pagan holoday of Beltane, held around on April 30. As time marched forward, all of these celebrations got folded into May Day celebrations. 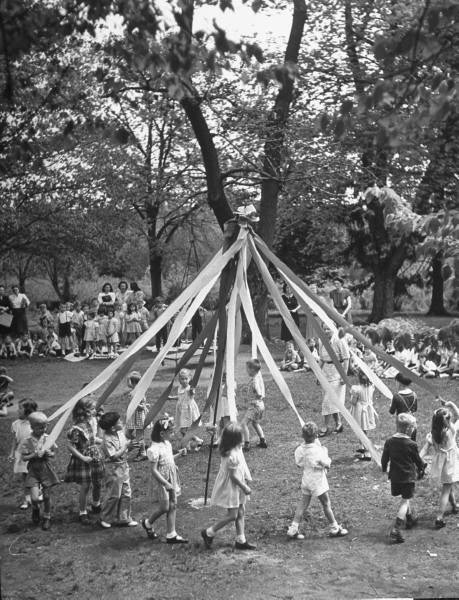 These May Day celebrations which have had increasingly waning popularity which I find so truly sad given the innocence and beauty wnd fun of May Day used to mean these May dances and Maypole. There was also once upon a time a lovely tradition of May baskets – little baskets of spring flowers and treats left anonymously with a glad heart for neighbors. England and Ireland still maintains a lot of the May Day traditions from what my research has indicated, and there they crown May Queens as well. In Finland they keep the tradition of Vappu, their May Day street festival and carnivals. May Day was lovely as a child. 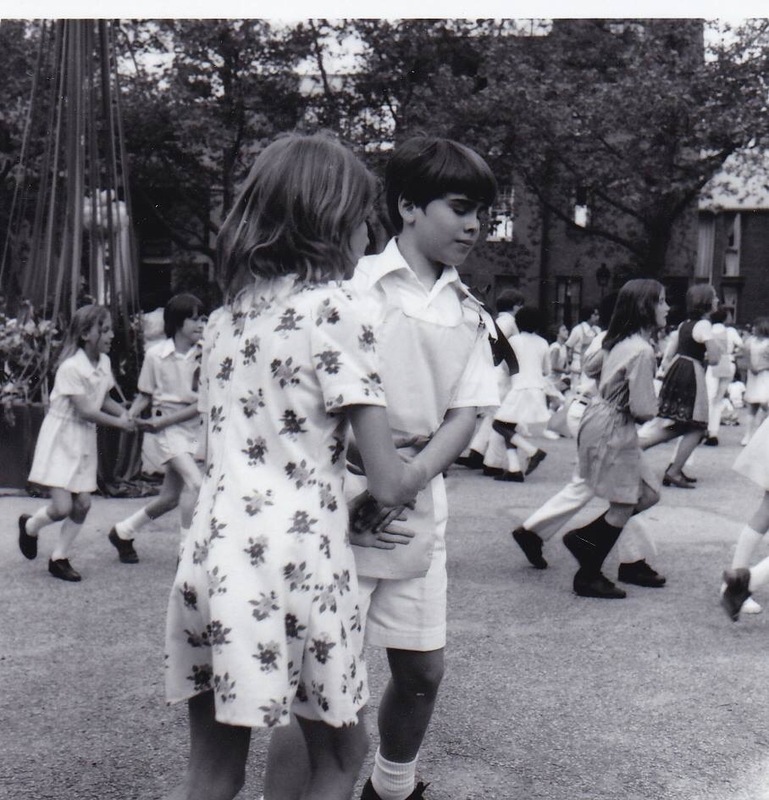 We felt so grown up and special dancing around the Maypoles. I am so glad I have those memories. Here is a link to a video of a celebration in a village in Cornwall – CLICK HERE. 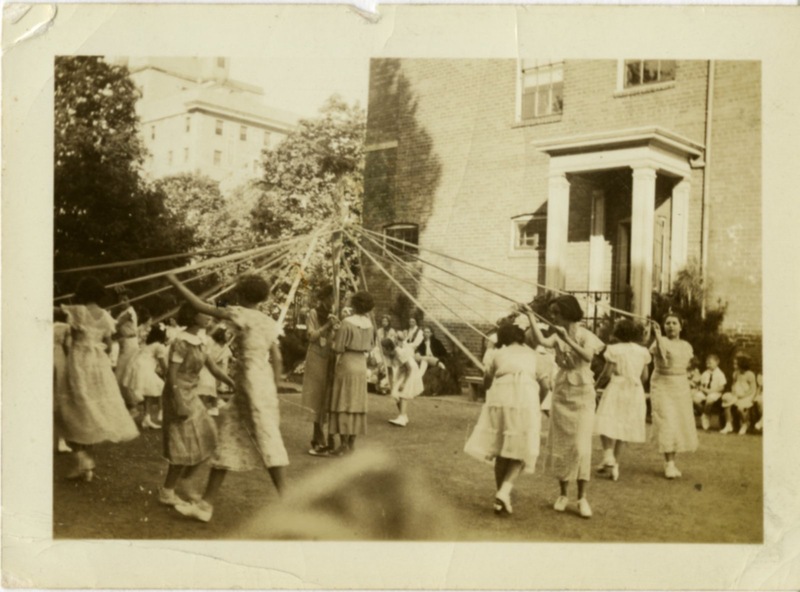 And Bryn Mawr College has a big May Day celebration as part of it’s traditions – CLICK HERE. At Bryn Mawr College they also have Morris Men who dance. Anyway, happy May Day and rabbit rabbit. This entry was posted in current events/news, History, home front, Life and tagged beltane, caroline seamans, eleanor poe barlow, may day, St. Peters by carla. Bookmark the permalink. out and got all tangled up! Great memories my children never experienced, all though I tried. Thanks for your story, Karla! It was so much fun and I am glad you liked my post!